Harry Bridgeland’s Saw Mill stood at the West End, beyond the school and opposite a pharmacy shop. Before the 1939-45 War a great deal of wood was used, enough to support this business in the village. 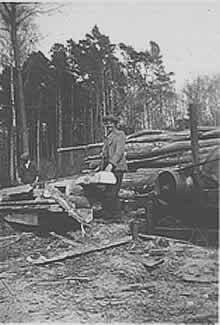 Frank Wood, who worked at the mill, said that Harry Bridgeland could estimate very accurately the amount of wood in a standing tree. The mill supplied wood for wheelwrights, builders, plough and harrow beams, fence poles, and even crucks for Rye fishing boats. The picture below shows a Bridgelands gang (Frank Wood facing on the right) felling trees in Mote Park, Maidstone, during the War. The trees were being removed because one had blown down during a gale, killing a soldier who was in the Nissen huts beneath. 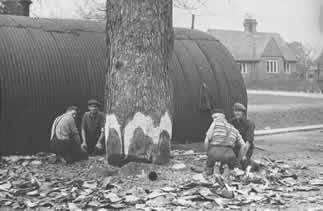 The huts had been built under the trees for camouflage but after they were removed camouflage netting was used instead. 7lb axes and a 12ft saw were used for the felling. 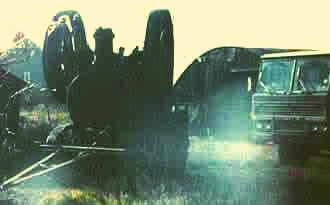 The Saw Mill closed in the 1960s, the picture below shows the end of the business. Note the old steam engine, a traction engine with no wheels which was used to power the saw. When it was in use, the scream of the saw and chuffing of the steam engine could be clearly heard in the School down the road. The Saw Mill was demolished in 1984.